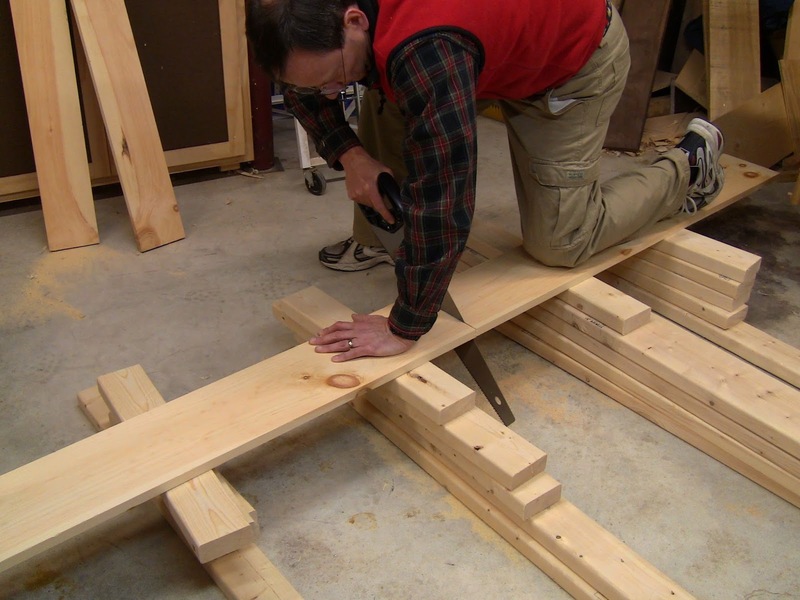 Building the bench consists of breaking down the lumber, building the top, building the legs, attaching them, and adding the cross-braces. So, how do you build something when you don't have a workbench to work on? You use your stack of lumber as temporary supports. As you cut parts, you can add them to the stack. Just be careful moving around it; since nothing is secured it's unstable. Cut the parts to length according to the cutlist below. Note that it doesn't include the cross-braces. Save one 2x4 for last for them, so you can size them to wherever the legs and pivot block end up. If you've made any adjustments to the plans, note the adjusted lengths on the cutlist. 2 Lower layer, wide 2x8 48"
1 Lower layer, narrow 2x6 48"
2 Upper layer, wide 1x8 48"
1 Upper layer, narrow 1x6 48"
2 Front apron 1x6 48"
2 Left leg 2x4 29"
2 Right leg 2x4 32"
2 Upper stretcher 2x6 20"
2 Lower stretcher 2x4 20"
Accurate measuring and marking, followed by accurate cutting and fitting, are the keys to precise woodworking, even with this low grade of lumber. Get in the habit of using these techniques. 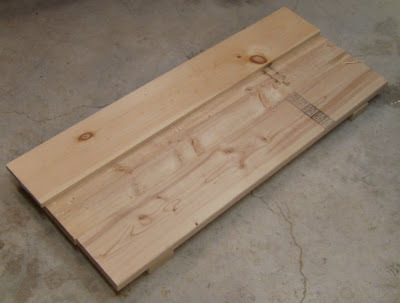 This bench is crude enough that you can get by with a little slop, and the hinges have some play in them, so don't drive yourself crazy going for perfection. You can work to within 1/64" precision, half of the smallest graduation on the combination square I bought. Work to the standard appropriate to the project. For a small jewelry box, you'll work to within finer than the thickness of a sheet of paper. To make accurate cross-cuts, use a knife line. That's what the utility knife is for, a marking knife. 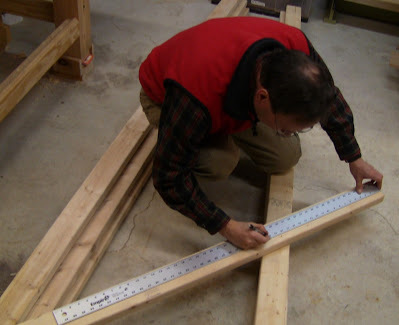 Measuring with a ruler or straightedge, make a mark at your measurement. Place the point of your knife in the mark. 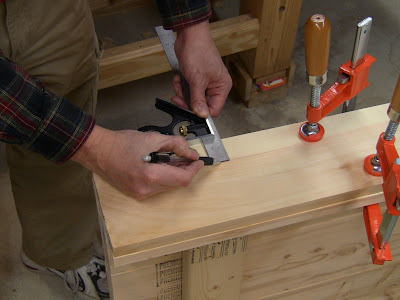 Place the head of your square flat on the edge of the piece and slide it over until the blade is up against the knife. This means the square is exactly on the measurement. Knife a line across the piece, using several passes to deepen it. 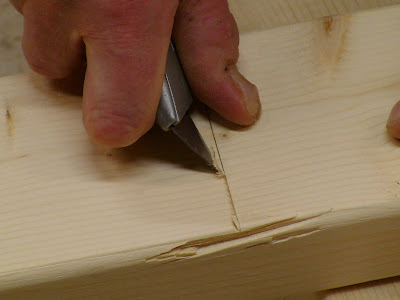 On the waste side of the line, use the knife or a chisel to carve out a small v-groove trough. Paul Sellers calls this a knifewall. 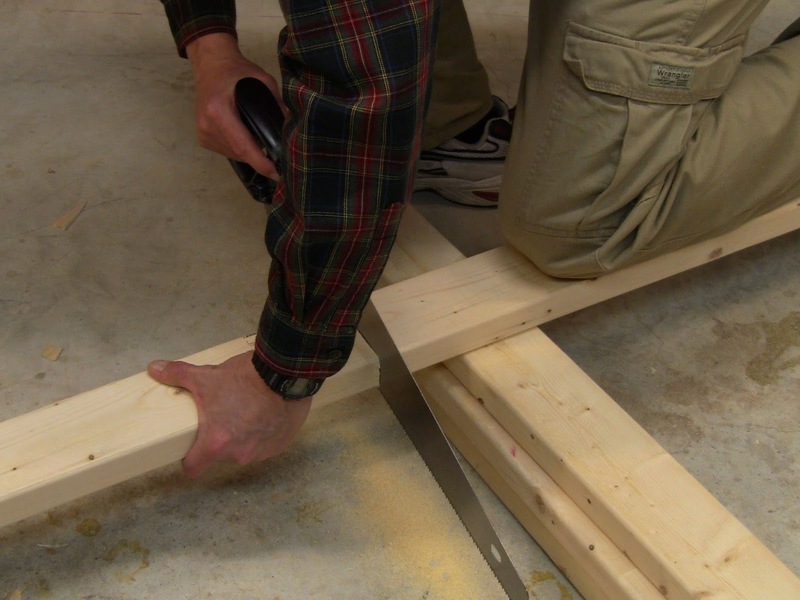 Use the straight edge to measure length. Make a mark at that point with a pencil or knife. Set the knife in the mark, align the square and slide it over against the knife, and repeatedly knife a line across. Carve out a trough on the waste side of the line. Rest the saw in the trough and start sawing with light, nibbling strokes. Because the trough is precisely positioned, the saw will be cutting at an accurate position and angle square across. That avoids the problem of the saw skipping around off the mark as you start the cut. Once the kerf is established, raise the angle of the saw and use steady full-length saw strokes. Catch the cutoff before it falls so it doesn't tear off a chunk at the corner. Support the work on the lumber stack as a makeshift sawbench. 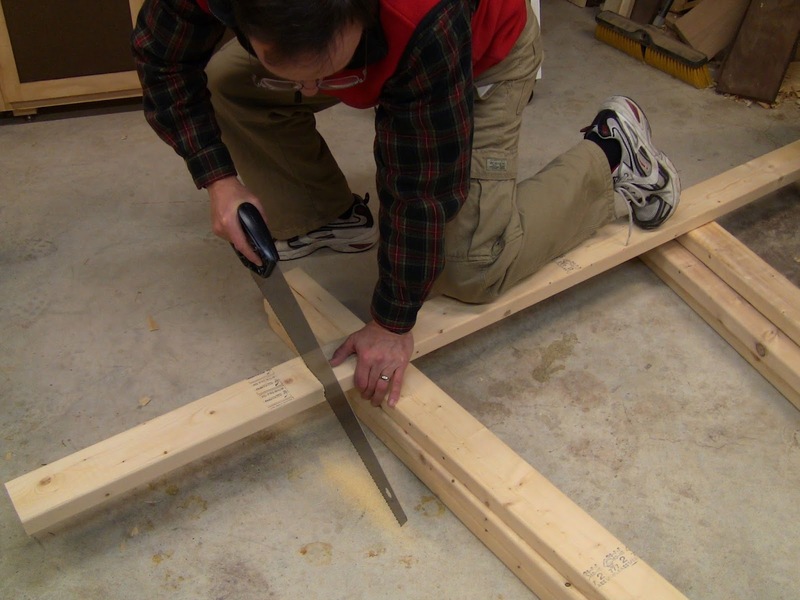 After starting the cut in the trough, raise the angle of the saw and cut smoothly and steadily. At the end of the cut, catch the cutoff so it doesn't tear off at the corner. Stack the cut parts higher for higher support. Two stacks on each side of the cut fully support the piece so it won't fall when the saw reaches the end. All the lumber cut to length except for two of the legs. 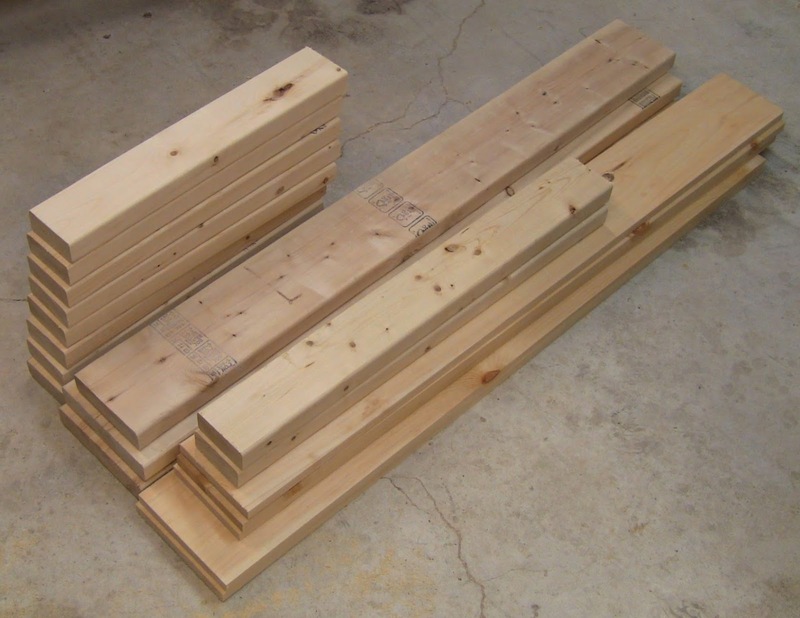 I modified the design for the upper stretchers slightly after I had cut these, so two of the short 2x4 pieces in the photo have been replaced by 2x6 pieces. The plan and cutlist show the correct parts. To build the top, edge glue the thick lower layer first, glue and screw down left and right spacers across the pieces, laminate the thin upper layer onto that and screw it down, and laminate and screw on the front apron. The combination of glue and mechanical fasteners is very effective. The screws also hold things in place while the glue dries. You can continue working if you want to, or wait until the glue dries at each step. There will probably be gaps in the glue; while you want to minimize these as much as possible, they won't ruin the bench. More clamps always help. Clean up any glue squeeze out and drips with wet paper towels. 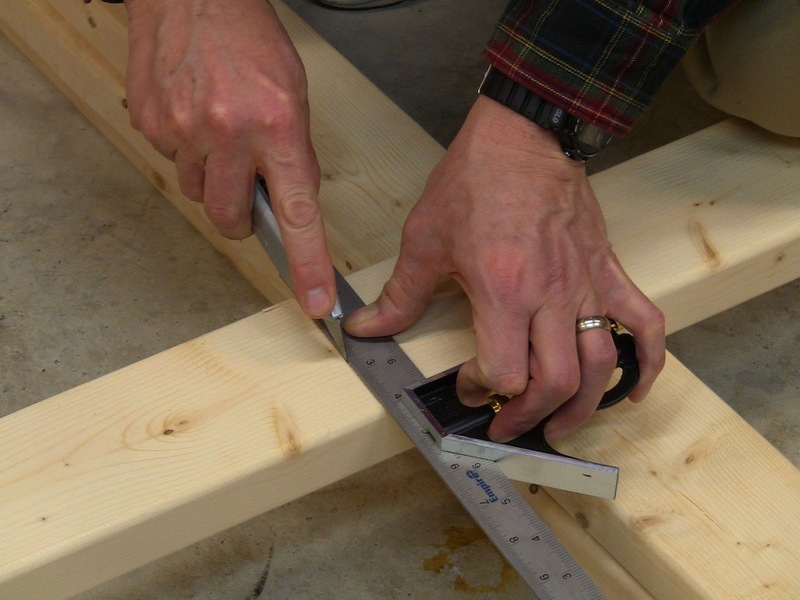 Apply a generous bead of glue to one edge of each 2x8 and spread it evenly with your finger. Lay these down and clamp them up edge to edge with the 2x6 in the back. The wet glue may make the pieces slide around as you tighten the clamps, so adjust their position as you go, making sure all the seams are flat. Spread glue along one edge of each 2x8. Lay them down flat with one end aligned and clamp them edge to edge. 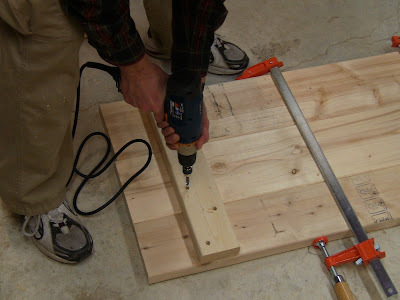 To attach the spacers to the lower layer, you'll drill counterbores and pilot holes. 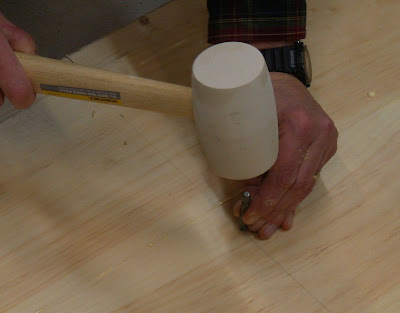 A counterbore is a hole wider than the head of the screw, so you can drive the screw down past the surface of the wood. It is only as deep as you want to seat the screw head. A pilot hole is a small hole narrower than the threads on the screw shank, to keep the wood from splitting as you drive the screw in. Mark in 4 1/4" from one end. Draw a guideline there square to the front using the combination square. Apply and spread glue to a spacer. Lay it down on the lower layer with its outside edge aligned to the guideline. With a 3/8" bit in the drill, counterbore each screw hole about 1/4" deep. Place the holes in a zigzag pattern along the spacer, two holes for each lower layer piece. With a 7/64" bit, drill one pilot hole in the counterbore at the near end of the spacer, making sure the spacer hasn't slipped out of place from the guideline. With the phillips head driver bit, drive a #10x2" screw in the hole. Repeat steps 4 and 5 with the hole at the far end of the spacer, again making sure the spacer is properly aligned. With the two ends of the spacer screwed down, it won't move, so drill the remaining 4 pilot holes and drive the screws in them. Repeat these steps for the spacer at the other end. Draw a guideline 4 1/4 in from the end, square to the front. Use the 3/8" drill bit to counterbore six screw holes in a zigzag pattern to a depth of 1/4". The depth doesn't have to be exact. After drilling pilot holes, drive #10x2" screws. Drive them at a low speed to avoid stripping out the heads. 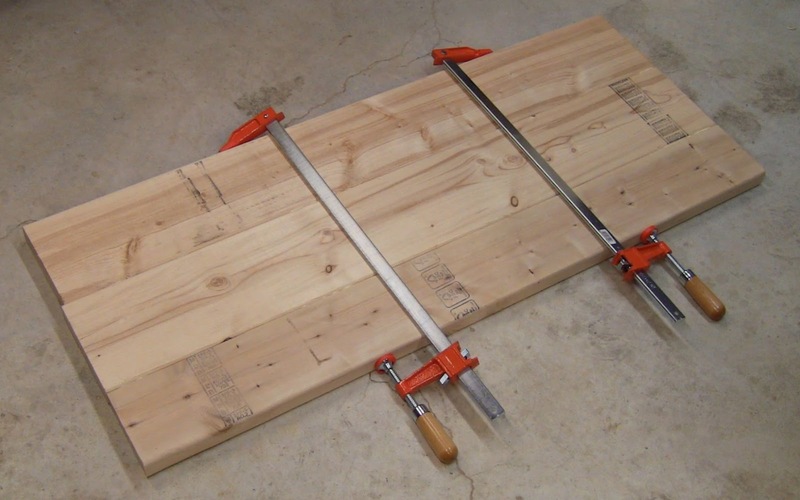 Remove the clamps and turn the top over onto the spacers. 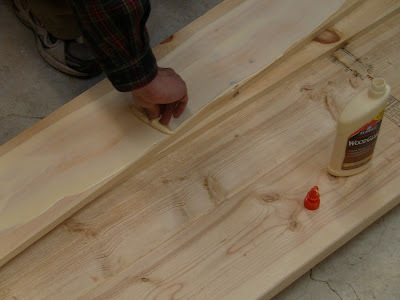 Pour glue one one side of a 1x8 and spread it evenly over the entire surface. 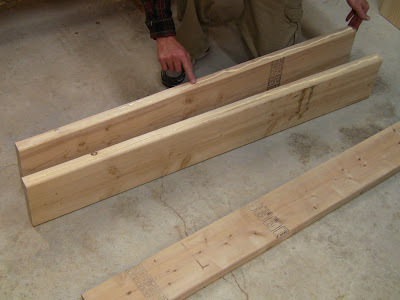 Turn the 1x8 over and lay it on top of the lower layer, flush with the front and one end, over the 2x6 and its seam with the 2x8. This staggers the edge joints between the two layers. Repeat steps 2 and 3 with the next 1x8, adding glue to its edge where it meets the first 1x8. Repeat steps 2 to 4 with the 1x6. Clamp across the top layer. 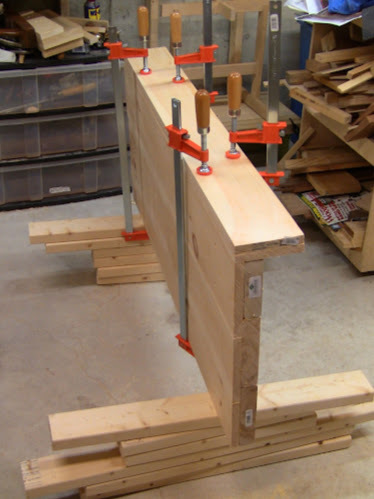 Put a 2x4 along the front to clamp it up flush with the front of the lower layer. Make sure the edge seams are flat. 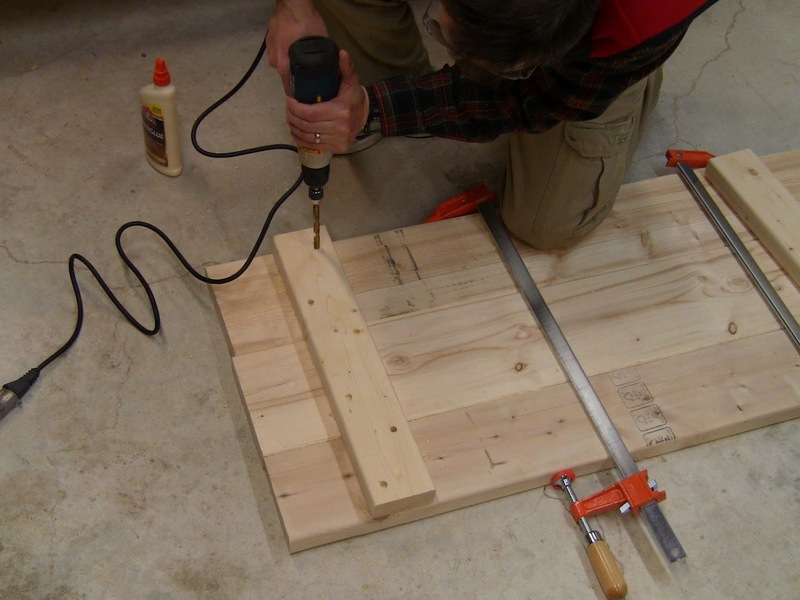 Glue the first 1x8 down over the 2x6 and middle 2x8 of the lower layer, flush with the front and one end. Pour and spread glue evenly over the next 1x8. Use a small piece of wood as a spreader. Draw guidelines for the screw holes over the center of the spacers. Draw two additional guidelines spaced 12" in from these. Use the phillips-head driver bit as a center punch to mark the position of screw holes along the lines, two per upper layer piece. Technically this is tool abuse, but it won't hurt the driver bit in this soft wood. 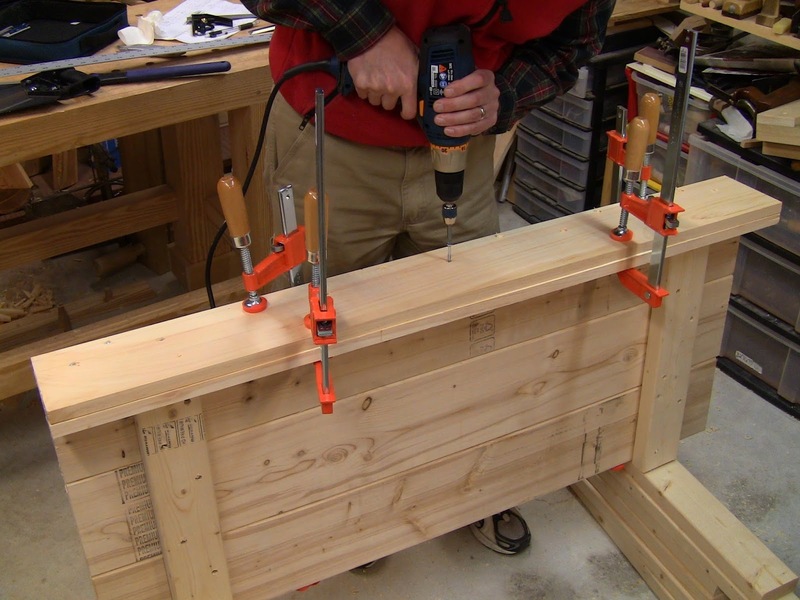 These punches will position the drill bit exactly and keep it from wandering. Counterbore screw holes to at most 1/8" deep. Drill pilot holes with the 7/64" bit. Drive #10x2" screws, making sure all the heads sit below the surface. Use the phillips driver bit as a center punch to mark the screw holes in a straight line on the top. Counterbore for the screw heads, drill pilot holes, and drive four lines of #10x2" screws. Note the 2x4 clamped across the front as a caul to flush up that edge. Cut that last pair of legs. The top makes a nice work surface stacked up on the other parts. Stand the top up on its back edge, raised up on the lumber stacks. Apply glue to the front edge and spread it evenly. Place the first layer of the apron on the glue, flush with the top and one end. Pour glue over the surface of this piece and spread evenly. Place the second layer of the apron on this and clamp everything across the top. 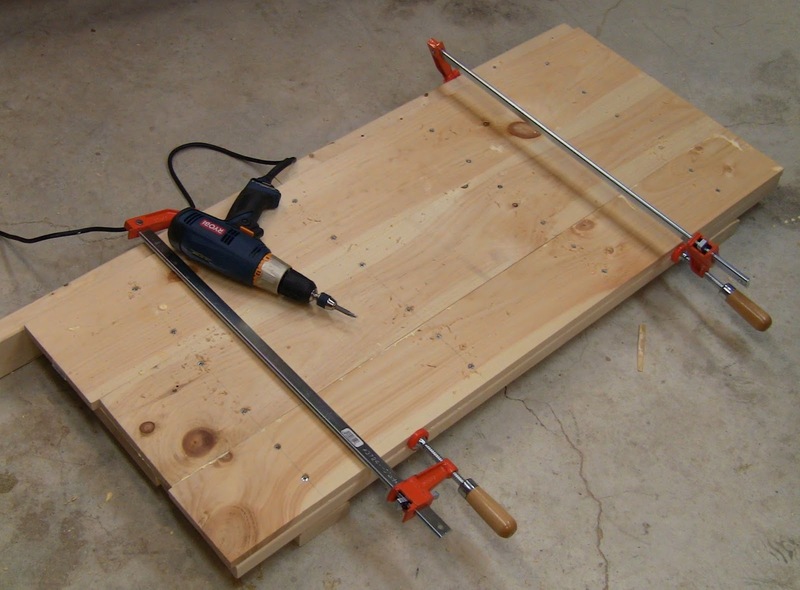 Use the smaller clamps on the bottom edge of the apron. Set the combination square to 1 1/2" (the thickness of the upper layer plus half the thickness of the lower layer). Use the square as a gauge to run a pencil line down the apron. This is a guideline for the screws; it will be in the middle of the lower layer thickness. Repeat steps 7 and 8, with the square set to 3/8". This puts a second guideline in the middle of the upper layer thickness. Punch for screw holes along these two lines in a zigzag pattern, starting on the lower layer guideline. Space the marks about 6" apart on each line. Counterbore, drill pilot holes, and drive #10x2" screws through the front apron into the top layers. Glue the pieces of the apron to the front edge of the top and clamp in place. The smaller clamps hold the two layers together along the bottom of the apron. 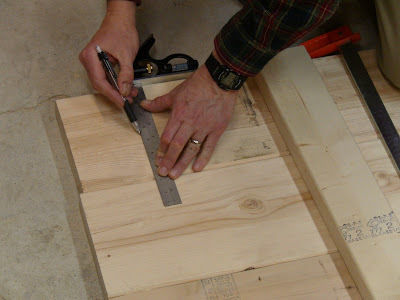 Use the combination square as a gauge to mark guidelines for screw holes. Drive #10x2" screws into the top layers after counterboring and drilling pilot holes. In part 3, we'll build and attach the legs. This is exceptional - very detailed with great photos. Looking forward to part 3. This is a great series. Thanks for the effort! I noticed in this one the "makeshift sawbench." Given that something this size can look a little intimidating at the beginning, how about a similarly built folding sawbench as a companion project to do first? Off-hand, I'm thinking it could be done with a single 2x10, a handsaw, some sandpaper (or a smoothing plane), and a drill/driver. Basically, a top, two legs, and a brace to go between them. 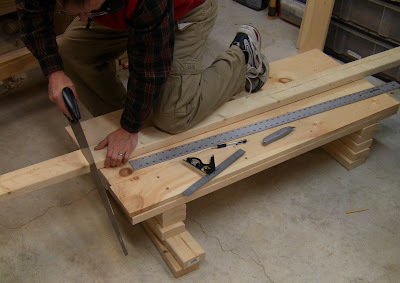 Angling the legs out towards the ends of the bench would probably help with stability, but be significantly more complicated for minimal gain. An 8' board would give two legs at about 20" each (or 20" for one and 20" minus a spacer for the other), 30" of length, and a long cross-brace to go between the legs when the thing was unfolded. Sounds like a blog post for Cheap Sawdust! When you do, let me know and I'll link to it here. Steve, you seem to have an allergy to Harbor Freight and I do to with the exception of clamps.Their clamps are possibly the only thing they sell with moving parts I use without reservation. I keep biting for their low prices and get regularly disappointed to the point that I'm beginning to be more and more willing to jump right into poverty to avoid the trip there. However, I do have a pretty good collection of clamps from the purveyors of "Ahhh, darnit!" Yes, any exposure to HF products has resulted in an extremely unpleasant allergic reaction, including their aluminum bar clamps. In order to avoid any further adverse reactions, I haven't tried any of their other clamps.